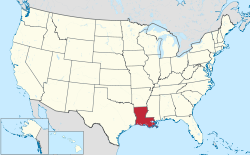 Louisiana is a state located in the Southern United States. According to the 2010 United States Census, Louisiana is the 25th most populous state with 4,533,479 inhabitants and the 33rd largest by land area spanning 43,203.90 square miles (111,897.6 km2) of land. Louisiana is divided into 64 parishes, which are equivalent to counties, and contains 308 incorporated municipalities consisting of four consolidated city-parishes, and 304 cities, towns, and villages. Louisiana's municipalities cover only 7.9% of the state's land mass but are home to 45.3% of its population. According to the 2015 Louisiana Laws Revised Statutes, residents of any unincorporated area may propose to incorporate as a municipality if the area meets prescribed minimum population thresholds. Municipal corporations are divided based on population into three classes: cities, towns, and villages. Those having five thousand inhabitants or more are classified as cities; those having less than five thousand but more than one thousand inhabitants are classified as towns; and those having one thousand or fewer inhabitants are classified as villages. The governor may change the classification of the municipality if the board of aldermen requests a change and a census shows that the population has increased or decreased making it eligible for a different classification. Municipalities are granted powers to perform functions required by local governments including the levy and collection of taxes and to assume indebtedness. The largest municipality by population in Louisiana in 2010 is New Orleans with 343,829 residents, and the smallest is Mound with 19 residents. The largest municipality by land area is New Orleans, which spans 169.42 sq mi (438.8 km2), while Napoleonville is the smallest at 0.17 sq mi (0.44 km2). The first municipality to incorporate was Natchitoches in 1712 and the newest is Central in 2005. ^ Baton Rouge consolidated with East Baton Rouge Parish in 1947, which combined the City of Baton Rouge government with the unincorporated areas of the parish. However, the Census only counts the population within Baton Rouge's city limits. This does not include the unincorporated areas. Baton Rouge would be the largest municipality in the state with a population of 384,452 if the Census included the consolidated areas in Baton Rouge's population. ^ The town incorporated on November 27, 2005 and thus does not appear on the 2000 census. ^ The town incorporated on October 7, 2000 and thus does not appear on the 2000 census. ^ Houma city is the parish seat of Terrebonne Parish, but is not a governmental unit having consolidated its functions with the parish. Since Houma city retains its city status under state law, the Census Bureau includes it as an incorporated place. Houma would be the largest municipality by land area with an area of 1,231.81 sq mi (and a population of 111,860) if the Census included the consolidated area within Houma's borders. ^ Lafayette city consolidated with Lafayette Parish. Public works and other services, such as land use and plat review, are operated by Lafayette Consolidated Government to serve the City of Lafayette and unincorporated areas of Lafayette Parish. However, the Census only counts the population within Baton Rouge's city limits. This does not include the unincorporated areas. The population including the consolidated areas is 187,713 and the land area is 222.08 sq mi. ^ a b c d e f g h i "GCT-PH1 – Population, Housing Units, Area, and Density: 2010 – State — Place and (in selected states) County Subdivision". 2010 United States Census. United States Census Bureau. Retrieved August 8, 2016. ^ a b "Louisiana: 2010 Population and Housing Unit Counts 2010 Census of Population and Housing" (PDF). 2010 United States Census. United States Census Bureau. September 2012. p. III-2. Retrieved August 8, 2016. ^ Louisiana State Legislature. "2015 Louisiana Laws Revised Statutes TITLE 33 - Municipalities and Parishes RS 33:1 - Petition for incorporation; contents; circulation; required signatures". Louisiana State Legislature. Retrieved August 28, 2016. ^ Louisiana State Legislature. "2015 Louisiana Laws Revised Statutes TITLE 33 - Municipalities and Parishes RS 33:341 - Division into cities, towns, and villages". Louisiana State Legislature. Retrieved August 28, 2016. ^ Louisiana State Legislature. "2015 Louisiana Laws Revised Statutes TITLE 33 - Municipalities and Parishes RS 33:342 - Change in classification of municipality; governor's proclamation; census not conclusive; judicial notice". Louisiana State Legislature. Retrieved August 28, 2016. ^ Louisiana State Legislature. "2015 Louisiana Laws Revised Statutes TITLE 33 - Municipalities and Parishes RS 33:361 - Municipal powers". Louisiana State Legislature. Retrieved August 28, 2016. ^ a b "Municipal Directory". Louisiana Municipal Association. Retrieved January 25, 2017. ^ a b "2000-2010 Entity Changes" (txt). 2010 United States Census. United States Census Bureau. Retrieved June 17, 2016. ^ Brand, Anna; Villavaso, Stephen (Spring 2011). "Revisiting Palermo: The Twentieth Anniversary of Louisiana's Landmark Land Use Rights and Zoning Decision and it's Legacy for Planning in Louisiana". Loyola Law Review. 57 (1): 113–133. This page was last edited on 13 September 2018, at 21:25 (UTC).